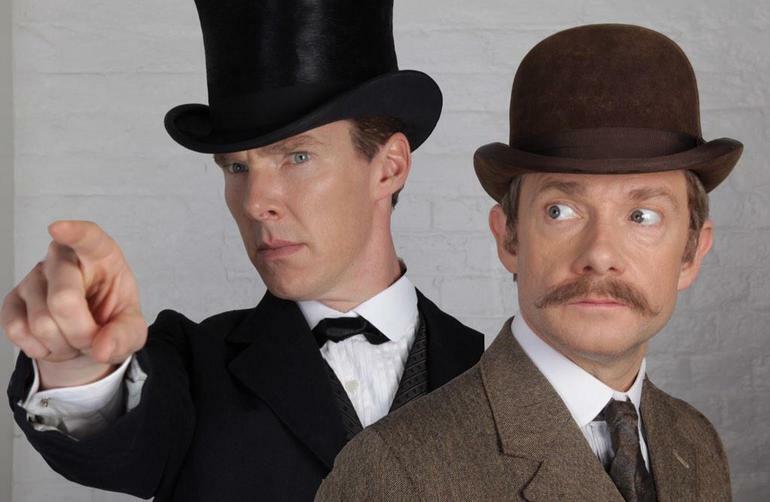 For the eagerly anticipated Sherlock special episode, Holmes and Watson are essentially going back in time. Co-creator Steven Moffat has now confirmed the special will take place in Victorian London, validating fan assumptions about the episode. Last month the show’s stars Benedict Cumberbatch and Martin Freeman were spotted filming Sherlock in 19th century clothes, causing fans to wonder if perhaps the crime-fighting duo attended a costume ball, or ir perhaps it was just some kind of dream sequence within the special. But no: The 90-minute episode literally takes place hundreds of years ago. The special is pretty much finished, Moffat added, and he’s very pleased with the result. No air date is set by Sherlock networks BBC and PBS Masterpiece, but the special is widely expected to air in the UK around December. Commentary: Hey, maybe this is part of the long-desired crossover with Doctor Who. Yeah okay, probably not. But this fanboy can dream, right. Since it's debut, BBC's Sherlock has always been very different from anything on the air. The use of unique camera tricks and visuals was a big part of the initial appeal to me. I will admit, when I started watching the show, I loved Martin Freeman, but had never seen Benedict Cumberbatch before. It might have been a little gimmicky at times, but it definitely caught my attention and brought me on board what turned out to be a brilliant written and performed show. And there has been a lot of speculation about where they at some kind of costume party or would they be doing a homage to the original stories. We still don't have all that much information, but I am eagerly awaiting this special. And hopefully Season 4 wouldn't be far behind.